The following is a bit of spiritual autobiography from Marc Boswell. In the essay, he explores his ties to both Christianity and Buddhism, tracing the way he first encountered Buddhist meditation and the ways this tradition has impacted his theology and spiritual life. These conjoined essays were originally written in 2015 and have been revised and expanded for this writing. Marc’s full bio is below. Around the age of nineteen, as a young fundamentalist Christian, I stumbled across the teachings of the Buddha. At the time, I was pursuing ordination in the conservative Baptist tradition of my childhood - the Free Will Baptists - a group that has centuries old roots in Eastern North Carolina. The discovery presented something of a problem for this young aspiring minister, given my denomination’s firm belief that Jesus is the only means of salvation. Other religious and wisdom traditions bore little value in light of their supposed oblique apprehension of Truth, capital T, over against the top-seated position that Jesus occupied on the hierarchy of religious systems of belief. Hell, we weren’t even sure if Catholics or Episcopalians were saved. Any pretension of other religions offering salvation was considered to be misguided, at best, and idolatrous, at worst. With gusto and fervor, we touted the typical evangelical understanding of John 14:6 - there’s no other way to heaven save the blood of the lamb, Jesus Christ. It was an allegiance we pledged, not necessarily to live as he lived, but to demonstrate that we earnestly believed Jesus was the only balm which could be trusted to eternally salve our guilty consciences. As pastors reminded us weekly in worship, our next breath wasn’t guaranteed, and God’s salvation - transacted instantly upon our expiration date - would be meted out in strict accordance with whether or not we uttered the sinner’s prayer (and really meant it). To genuinely consider the teachings of Buddhism, then, entailed an uncomfortable series of questions about the eternal fate of my soul. The religious diversity of rural, Eastern North Carolina consisted of good Christian and not-so-good Christian. The former attended church regularly, while the latter probably attended only once a month or a few times a year. The former abstained from (or hid their) cursing and alcohol, while the latter did not. For white evangelicals, our Christian identity entailed a Republican political affiliation, save for some older members of the “Greatest Generation” who voted Democrat, i.e., Dixiecrat, no matter the evolution of the Democratic party in the post-1960s era. Religious plurality, in other words, consisted entirely of different brands of evangelical denominations. I hardly knew a practicing Catholic, Episcopalian, or Presbyterian, much less someone who practiced Islam, Buddhism, Judaism, or Hinduism. Even for those folks who didn’t actively participate in church, religion was an inescapable reality - our language, our culture, our daily living was patterned around it. Evangelical Christianity paradoxically was such a ubiquitous reality that it could not be ignored, and, due to its saturation, it was so quotidian that it lost some of its luster and shine for the curious and adventurous. New ideas do not always meet eager learners in the South (or beyond), but there are plenty of parched souls who are aching for something more satisfying than conservative evangelicalism. I was one of those thirsty souls. Someone from outside of conservative Christianity should always consider the possibility that a portion of fundamentalists and evangelicals adhere to these expressions of faith because their culture is so homogeneous. This obviously isn’t true for every person, but it held true, anecdotally, for more people than just myself in several rural areas where I’ve lived. But even so, mere exposure to new ideas is not enough to puncture the quilt-like security and warmth of a dearly held ideology, even if it has its troublesome dynamics. It also takes a certain strong will, community support, and a willingness to have one’s ties to family and friends disturbed for an individual to fully embrace the journey of exploring and practicing those same new ideas. This can be true for the full array of cultural patterns of belief, including thoughts about race, religion, sexuality, gender, etc. Such was the case for me. I knew, and time eventually proved my concern correct, that my interest in other faith traditions (and liberal politics) would lead to a loss of friendships, denominational good standing, and certain job possibilities. Likewise, having the courage to explore certain ideas only came about due to the support of certain college professors and trusted friends. In this vein, my interest in spirituality, broadly conceived, was beginning to grow around the age of 17 or 18. Looking back, I’m sure I was beginning to wrestle with bigger questions of my identity and purpose as I was moving into adulthood. As I had always loved to read, this new fascination with spirituality and who I would be when I grew up led to a desire to explore Christianity primarily through books. The capitalist market, at this juncture, played an interesting role. Some of the larger cities near my small town of 1,000 people (Saratoga, NC) hosted locally owned “Christian bookstores” and the Southern Baptist sponsored LifeWay Christian bookstore chain. Whether local or chain, shoppers wouldn’t have found any progressive Christian writings or materials embraced by other mainline congregations (e.g., Episcopalians, Presbyterians, Lutherans). They certainly would not have carried literature from outside the Christian faith. If a text referenced another religion, it was from a theological viewpoint that considered them inferior to Christianity. The only ways to maneuver around this conservative stranglehold was through big box bookstores, and, perhaps, public libraries, though I was too consumeristic and blue collar to consider the latter. Thankfully, a Books-A-Million opened during my teenage years in nearby Wilson, NC. I doubt the store carried more than a small section of non-conservative religious literature, though there most likely was also little market demand for it, either. Their religion section consisted mostly of Christian devotional literature, with a few shelves reserved for philosophy and “eastern” religions. Driven partly by curiosity and, admittedly, by the exotic allure of anything outside of evangelicalism, I threw concerns about my eternal destination to the wind and began browsing through books about Buddhist meditation. Merely taking them from the shelf and flipping through their pages created an exhilarating sense of transgression. I’m sure I made a point to tell God in prayer that I was really just interested in meditation, not the Buddhism, much like white teenagers often tell their parents they like rap music just “for the beat, not the lyrics.” Surely God would understand that, I hoped. I did eventually purchase some books about Buddhism and meditation during these early years. I eagerly read Sakyong Mipham Rinpoche’s Turning the Mind into an Ally, which had just been released in 2004, and Eknath Easwaran’s Conquest of the Mind. Both books were written with the Western consumer and practitioner in mind, which proved to be a nice bridge for this anxious fundamentalist. Not long after reading these books, I came across Thich Nhat Hanh’s Living Buddha, Living Christ. As time passed, these readings and my own fledgling meditation practice began intersecting with my college courses in religious studies at the University of Mount Olive. My professors were well versed in gently guiding conservative evangelical students through the academic study of religion, both gently nudging us into areas of growth and holding us academically responsible for respectful understandings of faith traditions different from our own. These interfaith experiences provided a much needed opportunity to begin reconciling my curiosity in other religious traditions with my Baptist heritage. Though my visits and interactions had been life-giving, I knew that I would be on shaky ground if I expressed my interests with ministry colleagues or friends. I was beginning to cobble together a more expansive faith that fostered respect for other religions, but it was hard to say such things in public. Or from a pulpit. Or in answers to ordination questions. Merely writing an article, years later, about a friendship I formed with a young Muslim man that emerged from my visit to the aforementioned mosque was enough to make some Baptist colleagues ornery and concerned about the shape of my theology. As for my growing relationship to Buddhism, I remember quietly and awkwardly beginning my own seated meditation practice in my bedroom of my parents’ house. I lived at home during college, worked at a small grocery store and later at a small church as a youth director. I would sit to meditate with my back positioned toward the bedroom door. I’d set a timer for twenty minutes and strategically place an opened book in my lap so that if someone opened the door, I could pretend to be reading instead of pretending to be a Buddhist. After all, what Christian parent in the Bible Belt expects to find their twenty year old - who happens to be pursuing ordained ministry - busily hiding away in the middle of a seated meditation practice? I shouldn’t have cared what others thought, but the shame and the suspicion that accompany an encounter with a different cultural practice was organically present in the humid air of the South and within my being, too. Around this time, while walking through a local mall, I entered a small store that sold an impressive array of bongs and other smoking paraphernalia. What caught my attention, rather than the extracurricular smoking materials, was a small window display of figurines and trinkets, including a few Buddha statues. Feeling like quite the rebel, I dashed into the shop, looking over my shoulder for possible onlookers, and proceeded to purchase a small Buddha statue of my own, much like the one pictured here. No sooner than I stepped out of the store, the plastic bag slipped from my fingers. The Buddha, who was safely packaged in a box with tissue paper, fell to the ground. I was horrified. Tearing open the box, I found that the poor Buddha’s head had broken off cleanly from his torso. I immediately thought, at the time, that God snapped God’s fingers and caused me to drop and break my little idol. Shame on me. But I shook the thought, rushed home, surreptitiously secured some superglue, and proceeded to fasten the Buddha’s head back to his body. It remains resting there safely to this day. These are some of my early misadventures in exploring a few currents within the wider river of Buddhist traditions. My interactions with and study of Buddhist thought have continued for the past fifteen years, despite my shaky and anxious beginnings. I no longer identify with the fundamentalism and religious conservatism of my youth, and it is, in part, because of these early encounters with different ways of thinking about the Sacred. In the following section, I talk more about the reasons why I found Buddhist meditation techniques to be of such value for my spiritual life, along with an additional excursion into their implications for my still growing conceptualization of divinity and the nature of God. In my early twenties, I learned, according to the Myers-Briggs test, that I’m an introvert. A fairly strong introvert. I didn’t know this language prior to college, but it instantly made sense. There has been much more discussion in recent years about the identity of introverts, but fifteen years ago, such insight hadn’t begun to seep into mainstream culture. Being an introvert, as many now know, doesn’t mean that one is necessarily anti-social or shy or awkward in conversational settings. Rather, as a friend once quipped, it means (among many other things) that we have a contained amount of words to use on a given day. Whereas extroverts may have many words for small talk and other conversations, these social exercises quickly wear down the introvert. When the word count is used up, our desire to converse is quickly diminished. We relish and need time alone to recharge our batteries. Learning to embrace silence, therefore, can become greatly nourishing to our souls. In light of my introversion, I now better understand why I was feeling drawn to spiritual practices like meditation that don’t rely so heavily on words. The silent meditation - emphasis on the silence - of Buddhism and other traditions was a breath of fresh air and fit my spiritual life like a glove. To be able to sit in extended periods of silence gave me a sense of catharsis and healing unlike other, familiar spiritual practices of the evangelical Christian tradition. Talking to God in prayer, in the traditional evangelical manner, required - well - talking, even if those prayers were uttered quietly in one’s heart. Whether I was interceding, supplicating, or giving thanks, I still had to tap into my “word count” in order to carry on a conversation with God. One must remember that in the evangelical faith, prayer is a primary expression of one’s spirituality. Through bible study (another wordy enterprise) and prayer, one could commune directly with God. While these practices are fine ways to carry on with God, they also cornered the entire market of evangelical forms of personal piety. They were not only the most esteemed ways to practice one’s faith, they were essentially the only ways to be spiritually active. For me, this had become a problem. Out of this context, I began to read voraciously as much literature as I could find on Buddhist meditation. I cherished those moments when I could sit and attempt to clear my mind of words, concepts, and the notion that I had to converse with the loving-yet-temperamental deity on the other end of the spiritual phone. During this period, through other college classes, I was introduced to the greater wealth of spiritual practices within the wider Christian tradition. I learned of other Christian prayer practices that focused on contemplation, for instance, and that other Christians had practiced very forms of mysticism and meditation for centuries. I was pleased especially to learn about Christian contemplative prayer because, as mentioned in Part One, its explicit rootedness in Christianity made me feel a bit less heretical. I could load up on the works of great writers and teachers like Thomas Merton and Thomas Keating and placate my anxious conscience. With these writers, thus, I learned that I could contemplate and do so as a Christian, instead of meditating and worrying so much about identifying as a Buddhist. The relief I felt in being able to exchange my interest in Buddhism for Christian contemplative prayer was short lived. Something still seemed unsatisfactory about this practice. Many Christian writers described contemplation in a way that sought to reassure their audience (anxious people like me) that contemplative prayer was wholly different from Buddhist meditation. In contemplative prayer, one could look within the Christian tradition and focus on a distinctively Christian word or phrase - again with the words - in order to meditate. Some suggested mantras included “Jesus, Jesus,” “Lord, hear my prayer,” and “Christ have mercy.” If we meditated with language derived from the Christian tradition, then we’d feel less like apostates and more likely the publishers would also sell more of their books to Christian audiences. Either way, the reliance on words and phrases proved to not be as spiritually edifying as I had found with certain approaches to Buddhist meditation. * That is to say, it troubled me that it wasn’t quite acceptable to sit and rest in silence, not to mention the implicit suggestion that there was something awry with drinking from two different spiritual wells. Looking back, I can see now that I didn’t turn to the techniques of Buddhist meditation for the purpose of turning away from God or to cease communicating with the Sacred. Rather, I did so because non-discursive meditation provided an experiential point of contact with the divine that had hitherto been untouched in my prayer life. Knitter writes that he came to a similar conclusion. “What I’ve come to realize,” he states, “is that the reality and the Mystery of the interconnecting Spirit, precisely because it is Mystery, has to communicate itself or be felt through other ways than through words….If my use of words becomes an addiction of words, perhaps I am missing other, or deeper, ways of feeling or waking up to the reality of the mysterious presence” (Knitter, 137). During my early twenties, I couldn’t have stated that I was experiencing what Knitter called a “waking up” to an additional dimension of the Divine. At the time, I could only conceptualize God anthropomorphically. I could only picture God, in other words, as having the qualities of a human person. A male human person, particularly. If this is one’s only way of thinking of the Sacred, then a person’s spiritual life necessarily requires a discursive form of spiritual practice. One must talk to God, whether silently in one’s heart or verbally through praise and worship, sermons, Bible study and discussions, etc. Buddhist meditation, therefore, not only taught me a new way to pray, it also provided a desperately needed detour around an anthropomorphic mode of thinking about the Sacred which was beginning to be less meaningful and experientially truthful in my life. To state it differently, my soul was yearning for a concept and experience of the divine that wasn’t rooted in a theology anchored by a powerful male deity who held sinners in ‘H’is hands over the pits of hell. But I wasn’t simply looking for a more benevolent or less capricious version of that God, either. Instead, Buddhism provided a bridge that has slowly been built over numerous years to this different conception of divinity. What this theology looks like is perhaps best left for a future essay. And so, this is how a country boy reared among the tobacco fields and pine trees of Eastern North Carolina started to identify with both Buddhism and mystical currents in the Christian tradition. Perhaps it was mostly my introversion and my weariness with verbal forms of prayer. Or perhaps I was developing an allergy to the patriarchal deity who constantly used the threat of hell to keep followers in line. Or perhaps the homogeneity of the Bible Belt proved to be too confining for my growing interest in spirituality. Or perhaps it was a comment my dad once made, remarking that he often felt closer to God in the creeks and fields and the woods of our family farm than he did in church. Most likely, it was a combination of these and other factors. Either way, I’m grateful for this development. And I’m grateful to those, like Knitter and Merton, who moved forward in their engagement with meditation in a way that did not colonially co-opt other faith traditions into Christianity. I’m grateful for a community of Buddhists in Richmond, Virginia, who lovingly welcomed me into their group while I (and others) still maintained our ministerial affiliations and identities. I’m grateful for those quiet nights on Grove Avenue meditating imperfectly and intermittently, walking away with much needed spiritual nourishment. I’m grateful for the swamps and bayous of Louisiana, where I’ve tried to tap into that same silent, joyful, contemplative life that I believe my dad enjoys in the fields and forests of Eastern North Carolina. Whatever it is that guides us through, I give thanks to the Mystery in which we live and move and have our being, the same Mystery which found me thumbing through the pages of a book on Buddhist meditation all those years ago. Post script: I have intentionally avoided any language implying that I identify as a Buddhist. I admit that I stop just short of identifying that way primarily out of a sensitivity to not being another white Westerner prematurely co-opting or colonizing an “Eastern” tradition. I don’t mean to suggest that all white Westerners who engage Buddhism are doing so in a colonial manner and that I’m somehow above those dynamics. I’ve been supported and impressed with the genuine, deep, and respectful engagement of many white Westerners. This essay, however, is simply my effort to pay homage to a tradition that has deeply influenced my life for the past fifteen years. Without it, my spiritual life and approach to daily living would not be what it currently is. 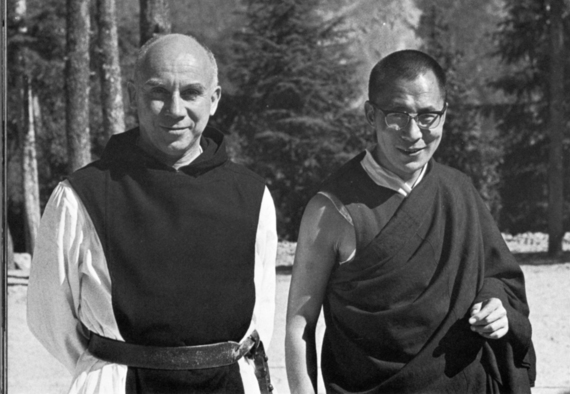 See also: Paul Knitter, Without Buddha I Could Not Be a Christian; Thich Nhat Hahn, Living Buddha, Living Christ; Thomas Merton, Zen and the Birds of Appetite. *It should be noted that various forms of Buddhist and Hindu meditation also encourage the use of mantras or phrases. There’s nothing wrong with this approach, but it didn’t represent what I initially found so satisfying about the particular Buddhist approaches I originally encountered and practiced. **It’s entirely possible that other writers on Christian contemplative prayer advocate for a non-discursive approach. However, I had yet to find them during this time in my life. Rev. Marc Boswell, Ph.D., is the founding editor of Progressive Southern Theologians. He currently serves as the director of the faith-based non-profit, Together for Hope, in Lake Providence, Louisiana. He has lived in the Delta for the past two years and enjoys photography and writing. His research and teaching interests include constructive/liberation theologies, community development, and race in American culture. He’s also a proud alumnus of the University of Mount Olive and Garrett-Evangelical Theological Seminary.